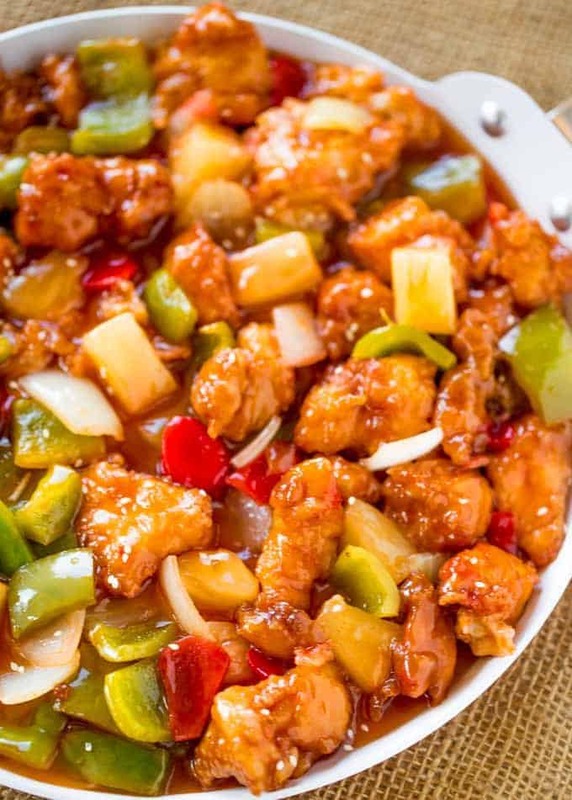 Sweet and Sour Chicken with crispy chicken, pineapple and bell peppers just like your favorite takeout place without the food coloring. 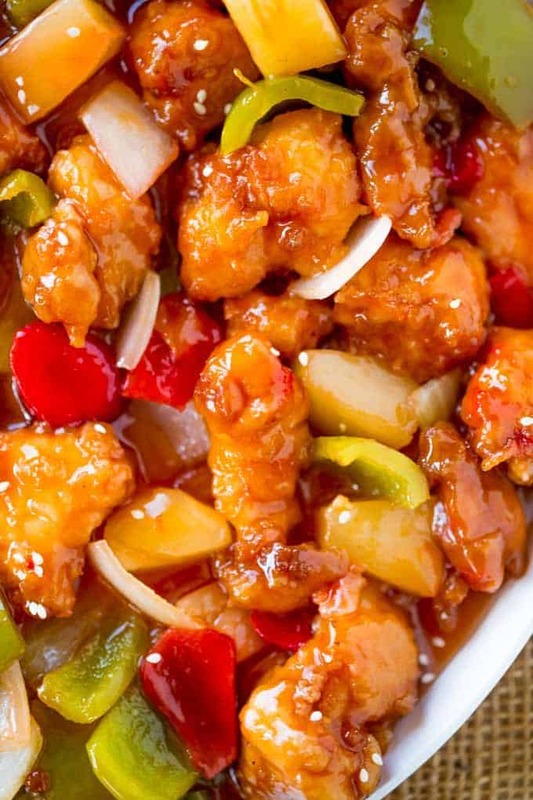 Sweet and Sour Chicken is a classic Chinese takeout option most of us are too afraid to make at home. Something about woks and cooking with pineapple make it intimidating for most, but it is so much easier to make than you would think. 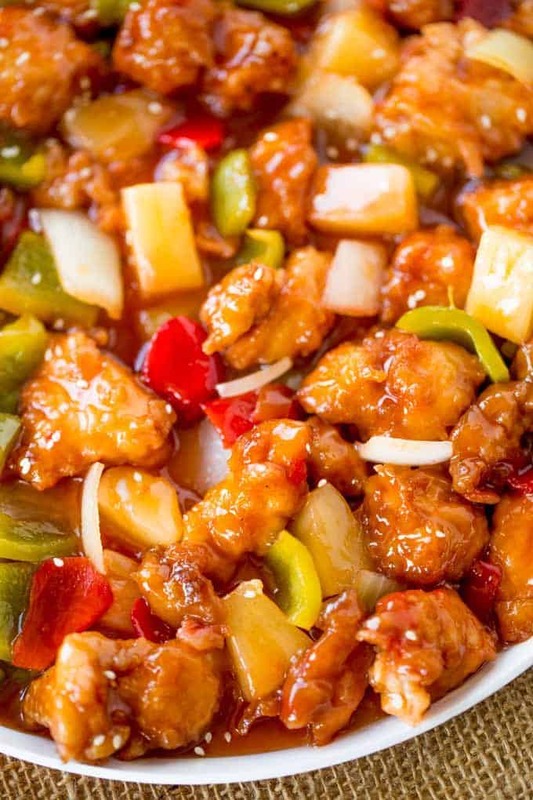 Of the classic Chinese Recipes that most people ask for on my blog the one I hear about the absolute most is sweet and sour chicken. I totally get it, it isn’t even just the recipe, but THAT SAUCE. When I was a teenager and I made this sauce for the first time I also actually started learning how to use chopsticks. 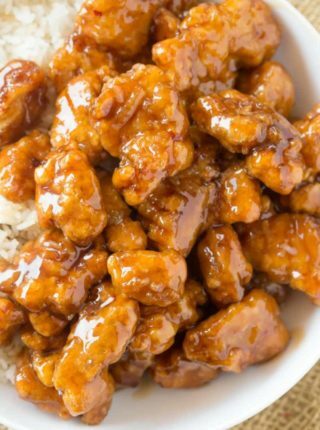 So for a solid month (I kid you not, my mom was not thrilled with this), I used chopsticks for every meal and had a tiny little bowl of Sweet and Sour Chicken Sauce to dip everything into it. 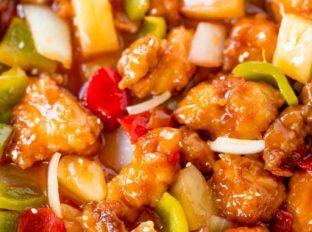 When it comes to making a good Sweet and Sour Chicken recipe there are a few tips I love to give out. Keep the breading super crispy and light. I have experimented with this recipe both in a tempura batter and a straight cornstarch coating. I prefer cornstarch for ease of use, but either way, you don’t want something doughy that will absorb your sauce like a sponge. Make sure you’re using GOOD pineapple chunks. I like either a super sweet fresh pineapple or the frozen chunks you get at Costco. They always have high quality frozen pineapple I’ve never been disappointed with. Don’t skip the onions. I know people may have aversions to them, but the onions and the bell peppers play an important role in balancing the flavors of the dish. Without them, you would have a completely sweet entree with only a sour punch from the pineapple. Adding a bit of bitter from the peppers and onions helps cut through the sweetness. Trust me, you’ll be trying to snag extra onion pieces (assuming you don’t already really hate onions). 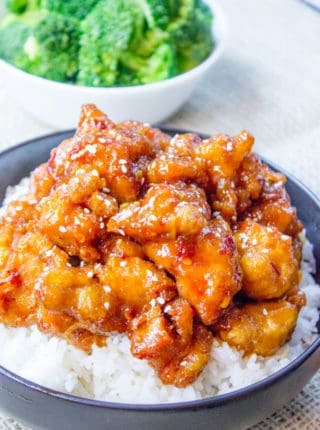 Want more Chinese Food Recipes? Wok: Great for high heat, quick cooking. This wok is a great addition to your kitchen if you love cooking Chinese food or stir fries in general. Large Frying Pan: I use this Cuisinart for most of my non cast iron cooking unless I am going with a stainless steel option, then I choose my All Clad. Low Sodium Soy Sauce: I find regular soy sauce much too salty, remember you can always add salt but you can’t subtract it. Starting with low sodium allows you to alter to your tastes if necessary. Frying Spider Strainer: This frying spider strainer is the quickest and easiest way to scoop out items that are fried without wasting too much time or getting too much oil out of the pan. You won’t have pieces burning like you would with a smaller strainer, plus it is SO inexpensive. I use it for almost all of my small fried items. 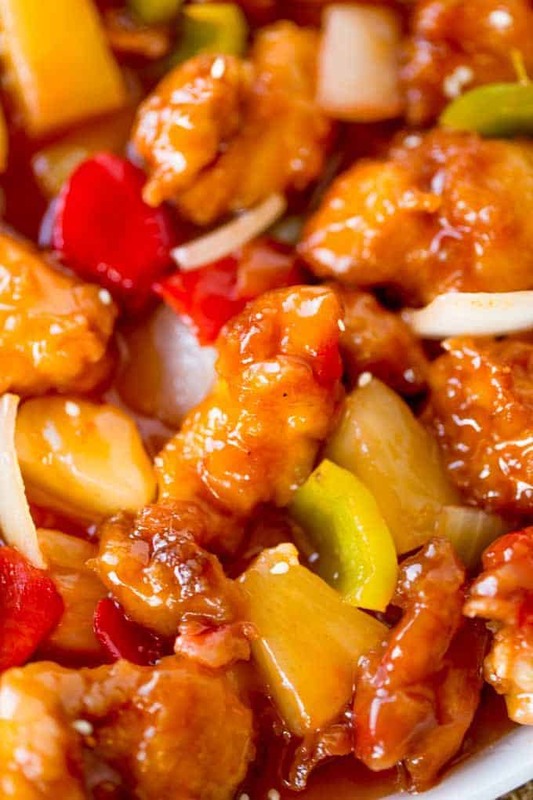 Sweet and Sour Chicken with crispy chicken, pineapple and bell peppers that tastes just like your favorite takeout place without the food coloring. To make the sauce, whisk together the sugar, brown sugar, apple cider vinegar, ketchup, soy sauce and garlic into a small bowl. Pour enough canola oil into a dutch oven or frying pan that is comes up from the bottom about an inch to an inch and a half. Heat the oil on medium high to high heat, you’re looking for the chicken to cook and brown in about 2-3 minutes. Add the cornstarch to a large ziplock bag. Add the chicken pieces to the large ziplock bag and shake until all the pieces are well coated. Dip the pieces into the egg, then into the flour before adding to the hot oil. Cook the chicken for 2-3 minutes, until cooked through and crispy. Remove to a cookie sheet (no paper towels!) and continue cooking all the chicken pieces. When done cooking remove all but a tablespoon of the oil. Add the bell peppers, onion and pineapple and cook for 1-2 minutes, until crisp-tender. Add the sauce back in and stir to coat the pieces and cook for 30 seconds to help the garlic warm through. Add the chicken pieces back in and stir until the sauce has thickened and bubbling. Serve immediately, with optional garnishes of sesame seeds or green onions. 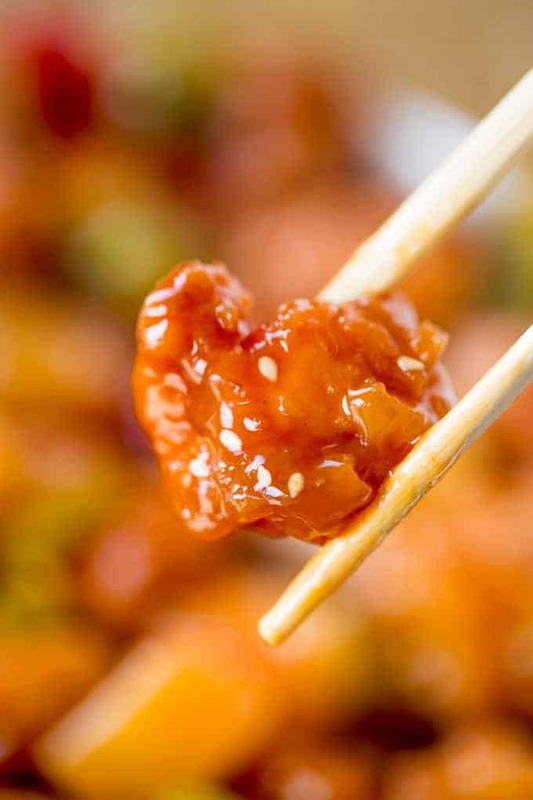 I have been looking for a restaurant that serves sweet and sour chicken just like this. I’ve been unable to find it. 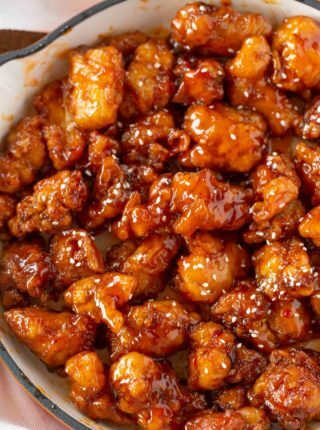 This is the best sweet and sour chicken I’ve had. I’ve made it a few time and I love it. I’m definitely going to look up more of your recipes. Thank you! So glad you found it, Sherri! Thanks for the 5 stars. Delish! I used rice vinegar and half acv and then thickened with cornstarch. My daughter is unlucky eater and said the sauce was better than chick-fil-a’s polynesian. She really loved the crispy chicken! I prefer serving it immediately but you should be ok just knowing that you might lose some of the crispiness. So glad you all enjoy it. Made this for dinner. Sauce didn’t thicken and was alittle to strong on the vinegar. Not sure what happen but other then that the chicken was very good. I was surprised. I’m going to try this but this feeds 4 to 6 people. There are many who have only two left at home when their children leave home. So it would be terrific if all sites like Allrecipes where a recipe can be scaled up or down to the serving size needed. Obviously I have no idea how to do that. It would be terrific if you could talk to someone about being able add the code needed to do that. Thanks for taking the time to read my comment!! I’m so glad you’re enjoying the recipes and the site. You are able to adjust each recipe in the recipe card. If you hover over the serving amount, there is a slider tool that you can use to adjust up or down depending on how many servings you’d like to make. Hope this helps! I was blown away by this! I subbed stevia for half the sugar but it was still amazing!!! Also added almonds and sesame oil and Edemames instead of so much chicken. Fantastic sauce!!! Yay!! I’m so happy you enjoyed it! To us it was too vingar-y, so my second batch I did a little over 1/4 cup of a.c. vinegar, and the rest water to make 1/2 cup. I added a little flour to help thicken it. I couldn’t figure out how to make it work with so little breading, I used 3 or 4 eggs, as well as about a cup and a half or more of flour. But then I had to cook it about 7-10 minutes. Came out excellent! Thanks for the feedback! So glad you enjoyed it! Can you use rice vinegar? Making this tonight for the first time! Can’t wait to try it especially after all the amazing reviews! We made this tonight for our family of seven- 5 kids ranging from 2 to 13 years old. It was a hit with everyone! Thank you so much for sharing such a delicious recipe. We doubled the recipe and did have some left overs. I found that it was the perfect ratio of sauce, chicken, and veggies/pineapple. This is definitely a favorite! Yay!! Definitely sounds like a winner. Sounds yummy. Would this recipe work if I just grilled the chicken instead of breading and frying it? I’m trying to eat healthier. Thanks! 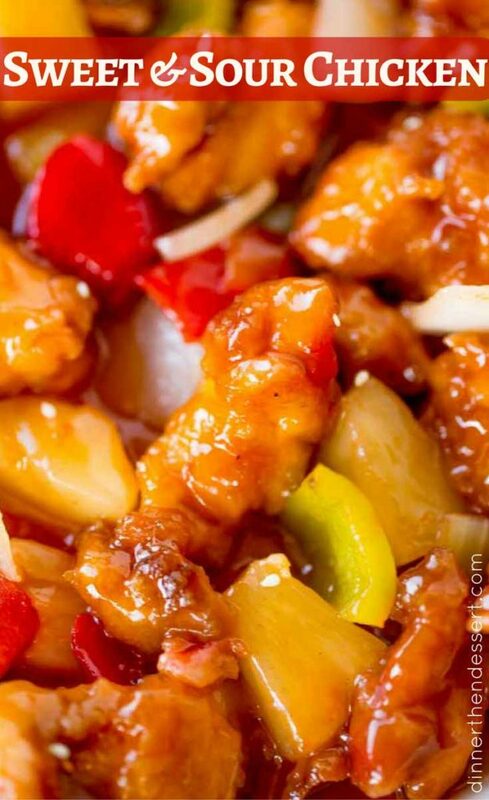 This is better than restaurant quality sweet and sour chicken…absolutely perfect without any changes. All of my kids enjoyed it too, which is bonus!!! 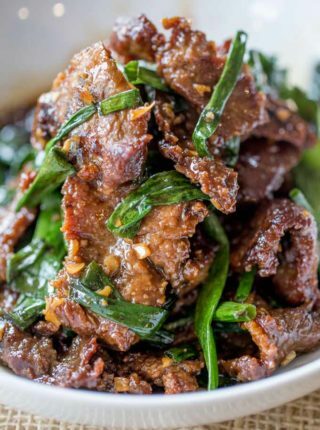 Can I use pork instead of chicken? I cant wait to try this! Do you think I could use my air fryer for the chicken? I’ve never tested it using one so I’m not sure it would work. If you decided to try, I’d love to know how it turns out. Thanks! I made this today and it is so good. Mine looked just like the picture. This recipe will be filed in my permanent recipe folder. Thanks. That’s such an honor, Myrtle! Thanks for coming back to let me know. Wow this was so good. The sauce is to die for. Tastes better than the restaurants. Chicken was tender and moist. Veggies were perfect and that sauce. Yum. We will be having this again. Excellent recipe. We give it 5 stars. This is truly one of the most delicious meals I’ve ever made. I had to use canned pineapple and frozen stir fry veggies because that is what I had in the house, but I followed the chicken and sauce recipes exactly. Some of the reviews suggested less vinegar or less sugar, but I thought it was perfect. Thank you! This was so easy and very good. I would recommend this for a great meal. Oh my goodness, the English major/master in me has to correct my typos of ‘jasmine rice’ and def no ‘??? ?’ with this recipe, only ‘????? ?‘ Again, incredible!?? This was incredibly delicious as are all of your Chinese recipes! I’ll never eat out again especially recognizing how many additives & chemicals are in restaurant foods in comparison to the simple and fresh ingredient list here. You are amazing- how did you master these so well?! Will be added as a new favorite go-to dinner for me, with some steamed Janine rice, hot jasmine tea, and fortune cookie of course! ? ?? ? You’re so sweet! Thank you so much for the kind words. Well, this was a pleasant surprise! It was a lot of work…because the chicken must be cut, cornstarched, egged and then floured, and after all of that…..FRIED! But, it comes out really good. I thought the sauce was smelled very vinegary, but it was really good. Also, I used fresh pineapple, omitted the peppers, because they make me sick, but added steamed carrots to have some color and it was great. I would definitely make it again. This isn’t a bad recipe, but I didn’t like the taste of the sauce. My bf told me there was no need for take out anymore! This was so good-the only change I made was to add broccoli instead of peppers because that’s what I had on hand. Delicious! So glad you both loved it, Alison! This recipe looks fab. How many adults does this serve? This recipe serves 6. Enjoy!